This collage was created with the use of many images, all blended together with Photoshop. Created by Milo Larson. The imagery within my collage comes from a range of different themes. Various textures such as space and static can be seen around the edges of the collage with a colorful image covering peoples faces. The main background is an image of a mall containing an escalator as a main focal point. I chose these images because they could be easily blended together to create the illusion of a single image. There are many elements and principles of design that make this image blend together. At first glance it is easy to see that deep purple lights on the escalator that contrast with the dark figures surrounding it. Also, the glowing faces of the figures contrast with their dark body. There is also a good sense of balance with the jagged pieces outlining the image. The size of each of the figures allows the viewer to perceive depth because the front two people appear larger than the figure on the escalator and the figures behind the escalator. 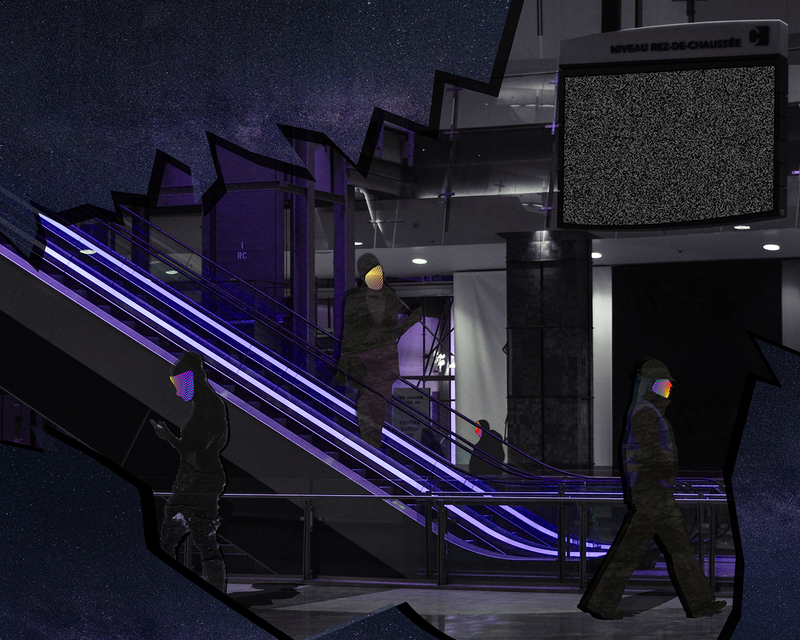 Originally this background image had blue colored lights appearing on the escalator. I was able to change the hue of the figures, the textures and the background itself to blend together. When looking at this image your eyes are drawn to the lightest areas that stand out. This includes the faces of the figures along with the lighted escalator. Once your eyes adjust to the image they start to see the subtle details such as the static and space textures. I hope people viewing this work feel that it is centered around the future and contains a technological theme. The figures represent people within the society that wear a figurative mask. The static screen represents the future of technology. With the development of new technology people become so attached to their devices, they are almost guided by its presence. Most of the layers in the collage were cut-out with the use of the pen or selection tool. Once these images were placed on top of each other I used the hue/saturation tool to blend the colors and lighting to match its surroundings. This specific image would most likely have to be constructed digitally because of the colors being blended by various Photoshop tools.